Kirk King was a Forward for the UConn Huskies from 1993 – 1997. His contributions in the 1996 Big East Championship Tournament Title Game were significant in helping the Huskies come from behind to win the game. Kirk also had a unique record at UConn with 22 consecutive field goals made in three back to back games. He was a solid player ranking seventh in UConn’s career field goal percentage list 53.0. I had the opportunity to talk to Kirk in August 2010, about his basketball memories and experiences. Kirk grew up in Baton Rouge, Louisiana. “I became interested in basketball just playing the game with everyone else, going to camp, and I fell in love with it.” While in school he enjoyed simply having fun meeting people along the way through his basketball travels. He helped Southern Lab High School win two state championships during his junior and senior year. When making his college decision it came down to staying in Louisiana or coming to Connecticut. 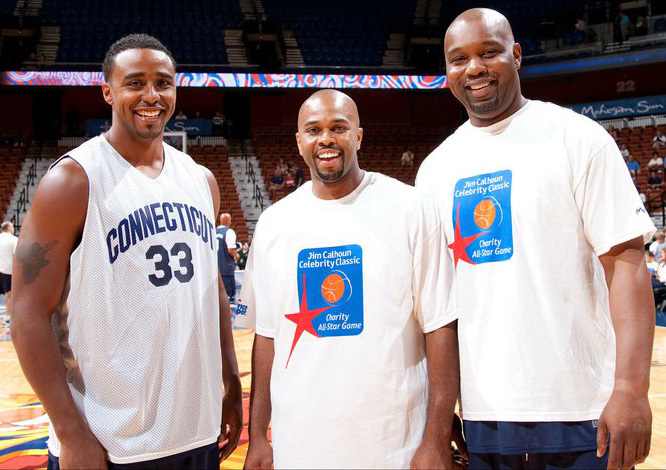 “I was going to play at home, but when I came to UConn there was something about this place that made me want to come, and this (the UConn Charity All-Star Game where Kirk and I talked) is a testament to why; to reminisce and see old friends.” The All-Star Game draws many former players to come back every year to support the Jim and Pat Calhoun Cardiology Research Endowment Fund for the University of CT Health Center. When Kirk arrived at UConn the biggest transition was not on the basketball court. “The hardest transition for me was the weather, coming from Louisiana. Once I got here, basketball took care of itself.” Kirk played in 114 games while at UConn, and averaged 5.8 points per game. He was in the starting lineup during his junior and senior years. As a junior he was third on the team both in scoring with 9.9 points per game, and rebounding with 6.3 per game. His senior year was cut short after fourteen games due to a National Collegiate Athletic Association (NCAA) suspension. Kirk had accepted an airline ticket to fly home and the NCAA’s penalty was huge. Coach Calhoun then named Kirk as a manger on the team. Kirk continued as a member and leader managing the team but couldn’t play. Kirk can look back and be proud. His suspension gave the freshman more playing time that paid off a few years later in 1999 winning the NCAA Championship. Kirk earned his Bachelors Degree in Sociology. After graduating Kirk was selected in the Connecticut Basketball Association (CBA) draft by the Connecticut Pride. Through trades he played for a few teams in the CBA over the next few seasons. Kirk also spent time playing for the CT Skyhawks in the United States Basketball League (USBL), and later he spent a few years playing in Europe until he had a knee injury that ended his basketball career. In 2010 Kirk was inducted into the Southern Lab High School Sports Hall of Fame. Kirk is married to Erica also from Baton Rouge where they currently reside. They have four children.